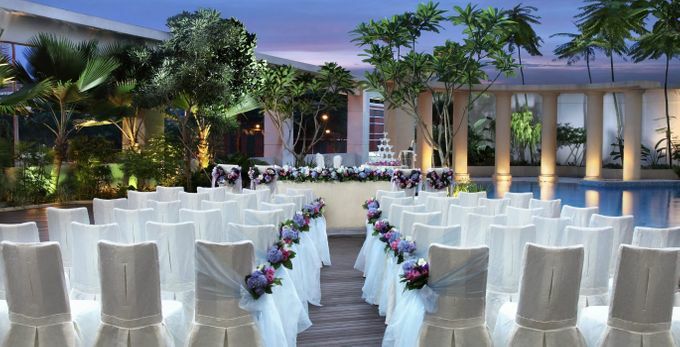 View our romantic poolside solemnisation venue amidst lush landscaped gardens and our elegant indoor reception space, perfect for a close-knit celebration of up to 13 tables. Amongst the strategic vendor services available include LightedPixels Pixies, Stardustwithlove Bridal Shoe Atelier, Kelly's Bridals collection of wedding gowns and suits, Once A Prop A Time and boutique skincare DrSpa. Exclusive Perks: $50 rebate per table | Free-flow of cocktails, mocktails and soft drinks during cocktail reception | Corkage fee waiver | Complimentary 1-night stay in Crystal Club Room for wedding helpers with buffet breakfast for two persons on the next morning. Register now: Email bqt.phcq@parkhotelgroup.com or call 6593 8825 / 59.